John Brister, a farm labourer from Sudbrooke, married Elizabeth Speed (born Frieston) in 1900. Elizabeth already had a 6 year old daughter. The following year they had another daughter and were living in Village Street, Ancaster. By 1911 the family was in Subrooke. In Jun 1913 John and Elizabeth were summoned to Sleaford police court for neglecting their 5 younger children. They returned to court in July, then again in Aug, when they were given a final warning. They must have finally complied with the court as the case was withdrawn the following week. They seem to have moved to Sleaford, where they were twice summoned for not sending the children to school. In 1915 the case was dismissed, in 1916 John was fined. In 1917 Elizabeth was fined for stealing beans at Holdingham. The 2 year-old mentioned in the 1913 court case was Charles David, known as David (also John’s brother’s name) who seems to have survived. But in 1918 the couple registered the birth of another boy, David (see below). By 1934 the family was living in the council houses at Normanton. During WW2 David Brister served in Royal Navy submarines. In March 1943 (aged 25) he was a leading stoker on HM Submarine Thunderbolt. Thunderbolt had been launched as HMS Thetis in 1938. In 1939 she was undergoing trials in Liverpool Bay and crammed with crew, specialists and observers, when the bow filled with water and sank in shallow water. Only 4 men escaped; the other 99 suffocated. 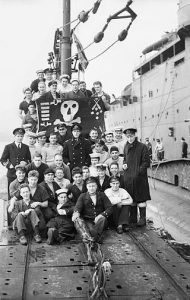 The wreck was recovered and re-launched as HMS Thunderbolt in 1940. 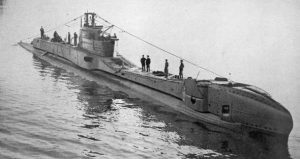 After operations in the Atlantic, Thunderbolt moved to the Mediterranean in Dec 1942, to launch ‘Chariot’ manned torpedoes against German and Italian shipping. On Sunday 14th March 1943 Thunderbolt was detected by an Italian corvette and depth charged. It sank in 4,400ft of water and all hands were lost. Their names are listed on the Chatham Naval Memorial. David Brister is listed on the Normanton war memorial.